To participate in the sale and sell your items, you will need to be a registered consigner in our online system and have a consigner number. 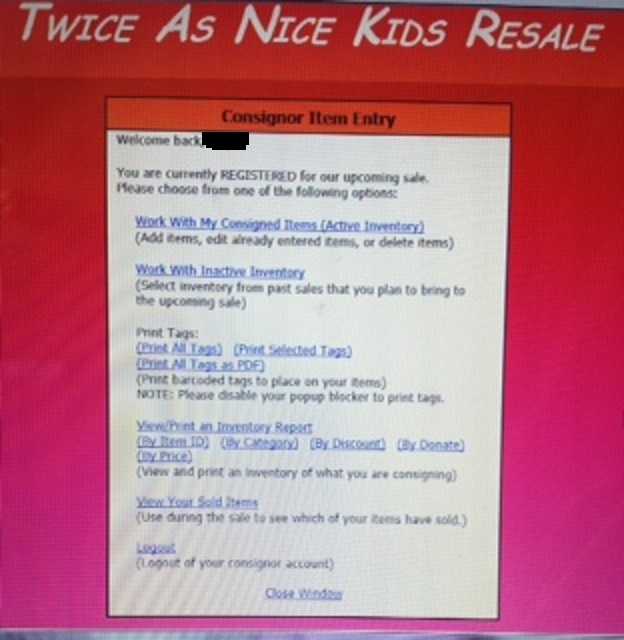 If you have not registered please go to the consignor page and register. Once you have registered, you can log into your account to begin the tagging process. Step 1: After logging into your online account you will see a page that looks like the first picture to the right. 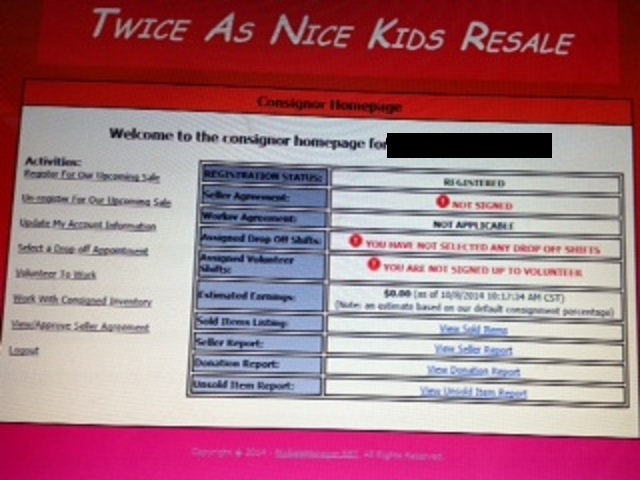 This is called you consigner homepage. From here you can make tags, print them, see your earnings, and work with your inventory. Step 4: After making an online tag for all your items, you can then just print them out using the print tag selection in your account. *Fill in all catagories when using online tagging system. 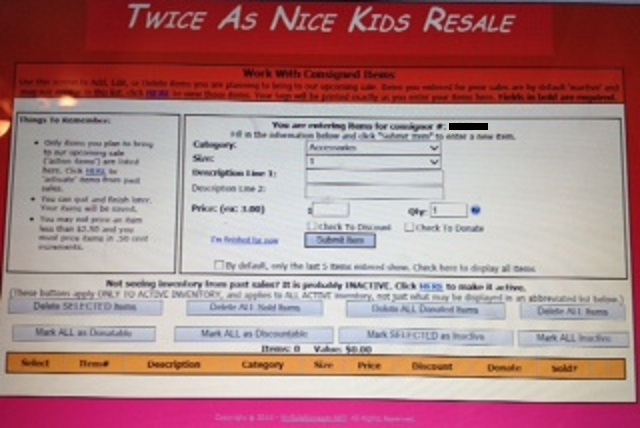 *The System has a check off box for if you want your items to be dicounted on half off day, or if you want your items donated after the sale. *Price items in 50 cent units(I.e. $5.00,$5.50) Nothing less than $1.00!! Price your items to sell! If you know that you would not pay $10 for an item then no one else is going to pay that either! *I strongly recommend tagging them for the half off day. Many shoppers come to the half off sale and specifically buy these items. Half off day is your chance to make big money!! 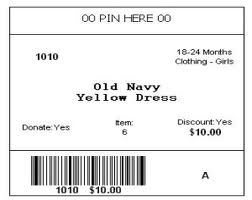 * You will need white cardstock to print your tags on. 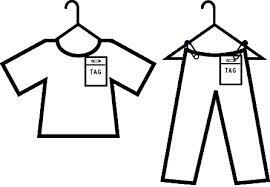 If you show up at your drop off with your tags printed on printer paper we will NOT accept them. There are no exceptions to this!!!!! After printing out a tag for the items, then you can attach the tag to the item. *If your clothing is falling off the hanger at home, then it is going to fall off the hanger at the sale. Pin it to the hanger so that you do not risk your items falling off and getting lost. • Toys/Décor need to be labeled with the cardstock tag attached using clear packing tape. No scotch tape!!!! If there are small pieces, place in Ziploc bag and secure to large item. • Place other items, such as shoes, bibs, bottles, bows, sleepers, towels, etc. in Ziploc bags. Place a completed card in each bag. Tape bag together with enough tape to keep it closed. Shoes can also be secured together using pin, zip tie,rubber band and then left out of bag~make sure tag is secure! Hangers go with items purchased for faster check out . Please make sure you do not use any hangers that you expect to be returned. We recommend wire hangers for the larger sizes and plastic childrens hangers for the kids clothes. Feel free to use the plastic hangers that come with childrens/infant clothes.